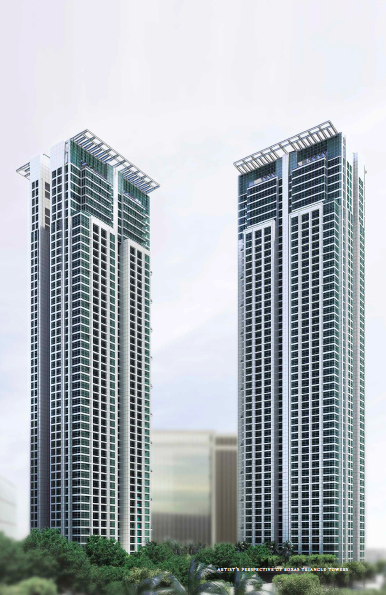 Roxas Triangle Towers is a two-tower development piercing the skyline at the heart of a great city. Launched in 1996, its first tower remains the city’s most esteemed premier residential community, maintaining among the highest occupancy and lease rates in Makati since its completion in 2001. 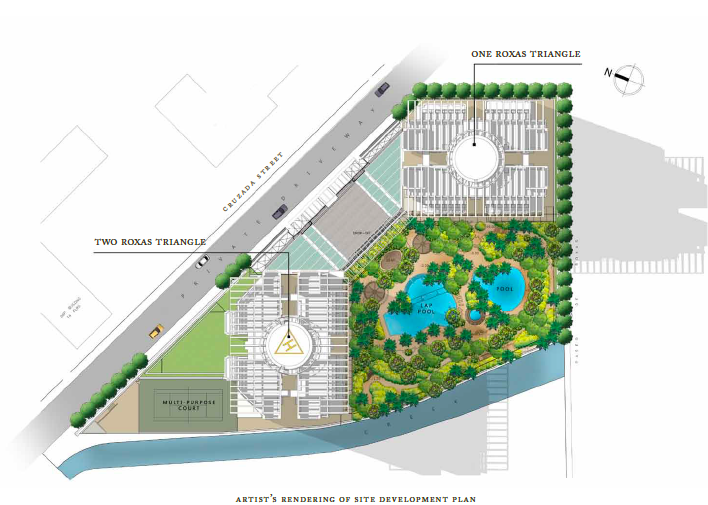 Two Roxas Triangle concludes the Roxas Triangle Development. A new generation is welcomed to the best of contemporary possibilities. A discreet location bring prime access and utmost exclusivity to a fine balance, ideal for enjoying the quiet and excitement that sets the country’s unrivaled financial capital apart. 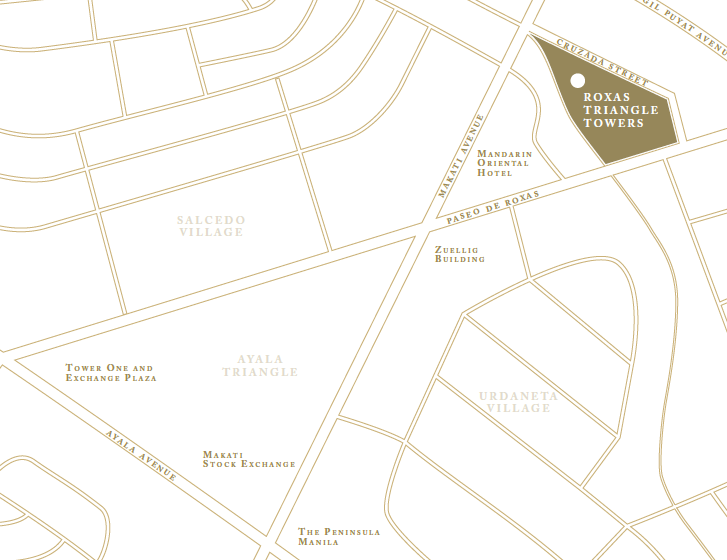 Roxas Triangle Towers rises on an 11,812-sqm property at the heart of the Makati Central Business District. Roxas Triangle and its complement Ayala Triangle form the infinity figure or the number 8, revered for heralding good fortune. Positioned at the corner of Paseo de Roxas and Cruzada Street, Roxas Triangle is one of the country;s most valuable locations hidden in plain sight. A classic arrival court welcomes residents home at Roxas Triangle Towers. Private recreational and health facilities – a number of which are presently existing – endow everyday with ease and grace. 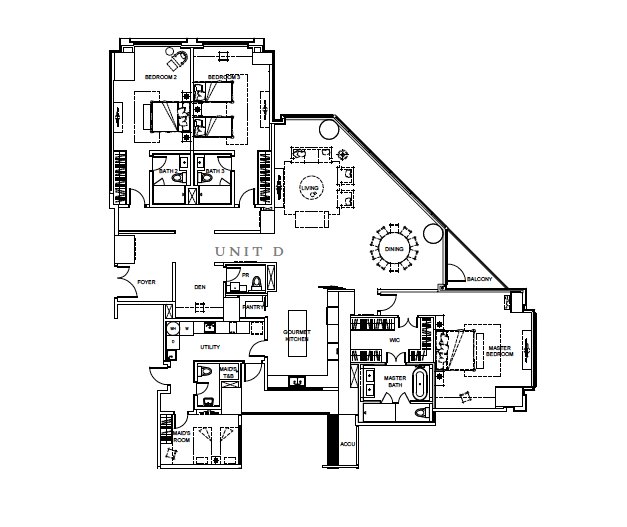 Comfort and privacy are elevated to a rarefied state, with elevators opening directly to lobbies exclusive to each unit. With a maximum of four units per floor, residences are generously proportioned, masterfully planned, and skillfully crafted. Three bedroom residences that are larger than usual at approximately 331 sqm. 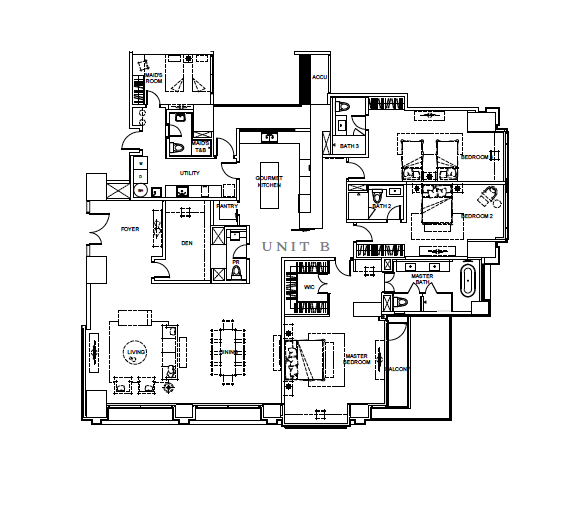 Distinctive features include: designer gourmet kitchens; utility kitchens with a separate service entrance; in Master Bedrooms, voluminous walk-in closets and T&Bs; stone flooring in the living, dining, gourmet kitchen, and Master T&B. At approximately 310 sqm each, these generously sized three-bedroom residences are available with balconies and without. Balconies on select floors provide approximately 4 sqm of outdoor space; one distinctive unit on the 4th floor cascades out on a 16-sqm area. 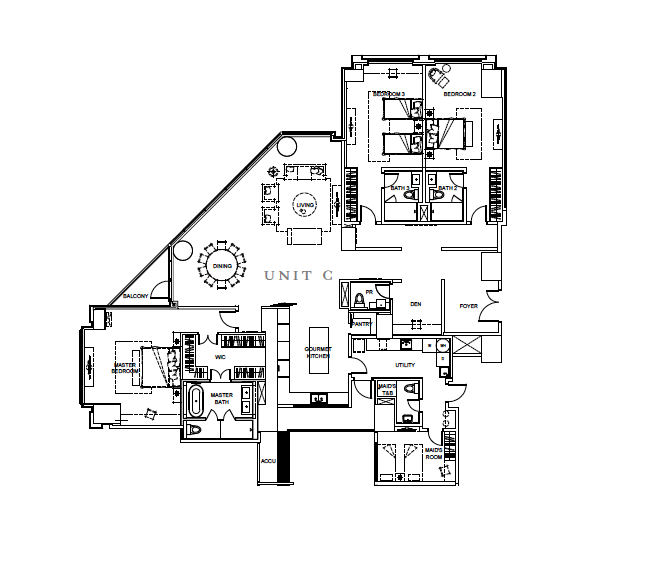 Other striking details include: designer gourmet kitchens; utility kitchens with a separate service entrance; in Master Bedrooms, voluminous walk-in closets and T&Bs; stone flooring in the living, dining, gourmet kitchen, and Master T&B. Three-bedroom residences encompassing approximately 304 and 302 sqm in interior space available with balconies or without. Balconies on select floors provide approximately 4 sqm of outdoor space. 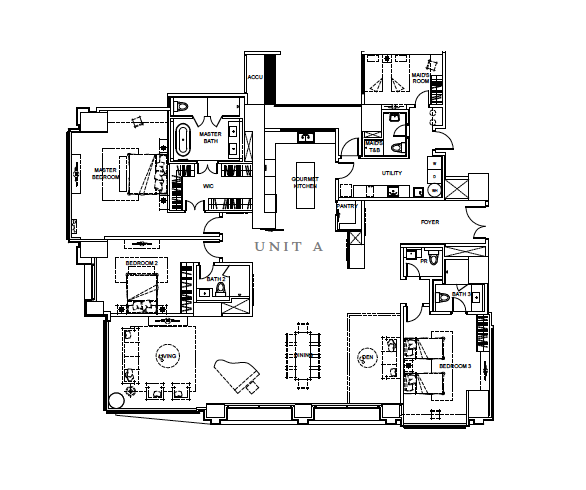 Other striking details include:designer gourmet kitchens; utility kitchens with a separate service entrance; in Master Bedrooms, voluminous walk-in closets and T&Bs; stone flooring in the living, dining, gourmet kitchen, and Master T&B. Roxas Land Corporation, the company behind the prestigious Roxas Triangle Towers residential condominium is a joint venture between Ayala Land Inc, Hongkong Land, and the Bank of the Philippine Islands. All leading companies in their respective industries, they now lend their expertise to the development of the second premium residential tower at Roxas Triangle, Two Roxas Triangle. Turnover commences in the 1st Quarter of 2019.